The increase in immigration from China continues unabated. The Chinese Student Protection Act after the Tiananmen Square incident granted permanent resident status to all Chinese students in the United States during the incident. The role of family reunification (“chain migration”) continues to play an important role in adding to the Chinese population. Within Chinatown, restaurants and their supporting business remain the basis of the economy and provide jobs for working-class immigrants. The high tech industries and universities continue to absorb educated immigrants and Chinese-Americans. In 2000 and 2010, the community – traditional organizations, residents, social service agencies – came together to develop the second and third Master Plans. These were the first initiated and conducted by the community. They emphasized the need for affordable housing and continued social services. Limited by space within Chinatown’s core, growth has expanded to Quincy and Malden, linked by the Red and Orange subway lines. Skilled workers in the high-tech facilities along the Route 128 corridor have found homes in the western suburbs, forming small Chinese concentrations. Big Dig eliminates elevated Central Artery. Downtown Boston – financial services grows. Retail continues to decline. Market housing increases. Emerson College and Suffolk University expand into downtown. Big Dig opens sites for Chinatown Park and Parcel 24. Re-routing of Orange Line opens housing sites for Oak Terrace and the Metropolitan (plus space for community organizations). Chinese Community Education Center built to house Asian American Civic Association and the Kwong Kow Chinese School. YMCA relocated to Don Bosco High School site. Tufts Medical Center expansion – new buildings and rehab. Emerson College and Suffolk Univ. revives theaters and old buildings for dormitories. Growth in the western suburbs (Brookline, Lexington, Newton, Acton) for professionals. Growth in Quincy and Malden as Red and Orange Lines extended. The increase in immigration from China continues unabated in two distinct streams. One was the highly educated professionals whose numbers were increased by the act permitting the Chinese students who were in the U.S. at the time of the Tien An Men incident to be granted permanent residence status. Many Chinese students in the United States had supported the demonstration and it was feared that these students might be subjected to harsh retaliation when they returned to China. The students who stayed became professionals. On the other hand, the Family Reunification Agreement made possible the immigration of relatives of Chinese Americans. Many came from the rural areas of Taishan County in Guangdong. They generally did not speak English and worked in low-wage jobs in restaurants, grocery stores and food processing. They needed housing and the services of the social agencies. 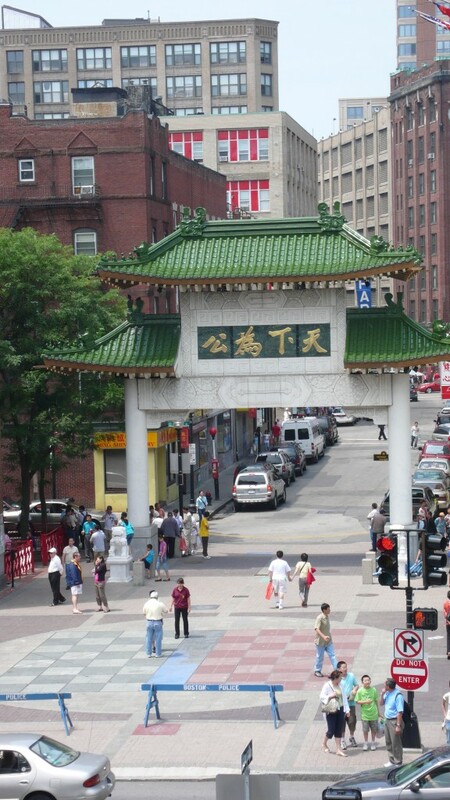 As a result, the mainly Cantonese speaking working class group settled in Chinatown, Quincy and Malden. The extension of the Red Line to Quincy/Braintree and the Orange Line to Malden/Medford enabled people needing connections to Chinatown to find better housing. There are now more Chinese in Quincy, Braintree and Malden than in Chinatown. The higher income mostly Mandarin speaking group settled in the western suburbs – Brookline, Newton, Lexington, Acton etc. This was a period of increased focus on housing and further development and expansion of community institutions. Mayor Ray Flynn and Stephen Coyle, director of the Boston Redevelopment Authority were instrumental in helping the community find sites for housing and to resolve disputes with the Tufts-New England Medical Center (T-NEMC). 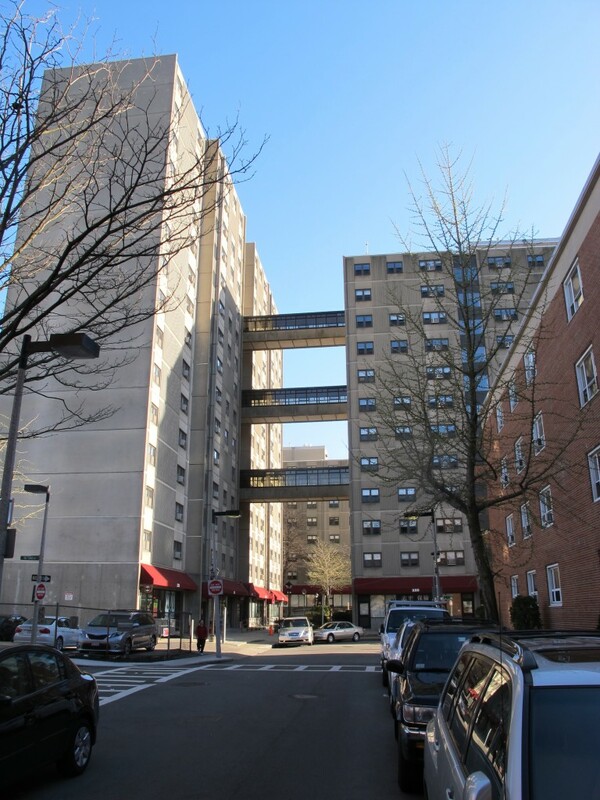 The Flynn administration with the help of Governor Dukakis and Councilor Bolling also initiated the linkage program to funnel funds from downtown projects to benefit neighborhood projects and needs. In 1987 as part of the linkage program, Chinatown community members formed a minority-owned joint venture to build on a parcel on Essex St. Despite many delays, the One Lincoln Street project was finally realized. In 2004, $2.6 million was generated from the development to the Chinatown Trust Fund for affordable housing, youth and family services, cultural and community events, public safety, job training, education, and business district improvement. Up to 2010, the Trust had provided more than $2.8 million in loans and grants to local organizations. The Asian Community Development Corporation (ACDC). When the Orange Line was relocated and the elevated tracks were demolished, an Urban Renewal housing site became available. 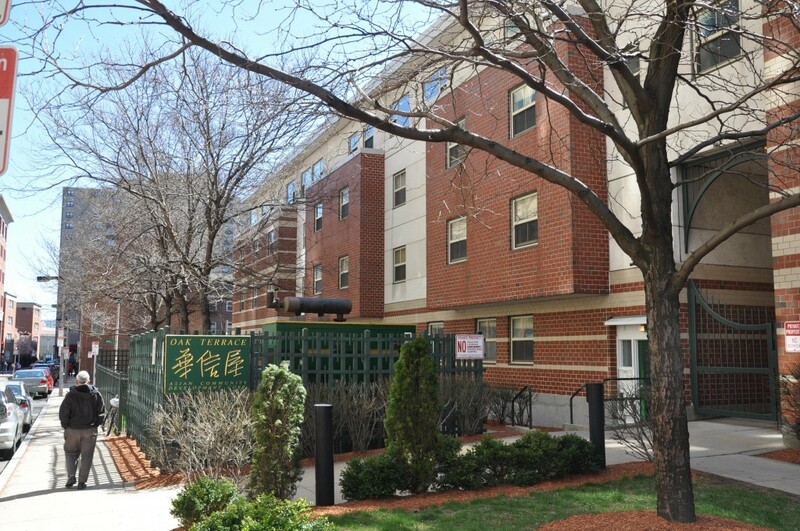 The Asian Community Development Corporation was founded to plan and build Oak Terrace – 88 units of affordable housing for over 300 residents. 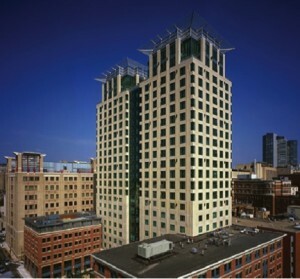 The Metropolitan – the low-rise buildings house social service agencies while the 23 story tower provides 251 rental and homeownership units, 115 affordable. ACDC photo. After a long battle with T-NEMC over a garage on an urban renewal site, ACDC developed the Metropolitan, a mixed income high rise housing also providing homes for itself, the Chinese Progressive Association (CPA), Boston Community Neighborhood Center (BCNC) and Youth Essential Services (YES). Wang YMCA. 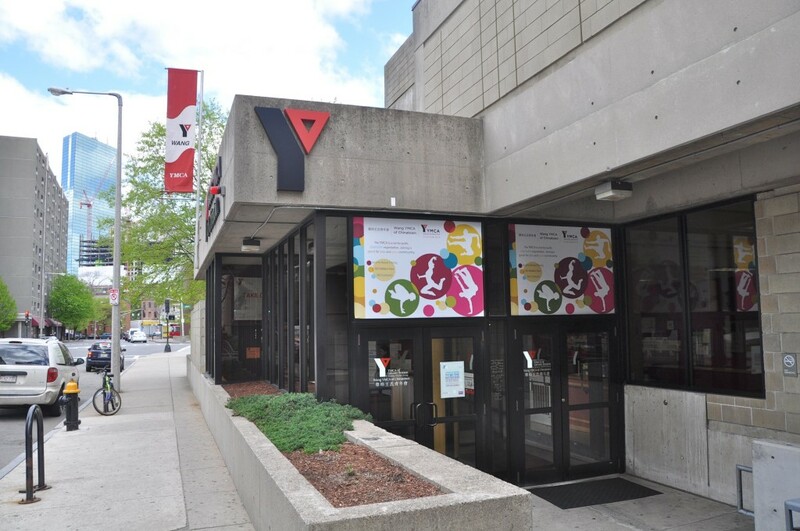 The Chinatown YMCA was started in 1914 by missionaries to provide housing for the bachelors. In the 1990’s, a new facility with expanded facilities and programs including a swimming pool and fitness programs. It was opened on the site of the old Don Bosco High School in conjunction with the Doubletree Hotel. Wang YMCA at 8 Oak St. Appalled by the deterioration of the Chinese burial grounds at Mt. Hope Cemetery, Davis Woo and David S.Y. Wong started a project that has built a modern memorial altar and beautified the grounds. Out of that efforts CHSNE was founded in 1992 and has since published a book and an annual newsletter. It is also a repository for photographs, documents and artifacts of Chinatown history. The South Cove Manor was developed to provide nursing care for the increasing number of frail elderly. A new Chinatown Community Education Center (CCEC) was completed in 2008 on Tyler Street to house AACA and the Kwong Kow Chinese School – a heritage language school devoted to the teaching of Chinese language and culture. The CEEC on Tyler St. opposite the historic Quincy School. The Big Dig replaced the old elevated Central Artery with a tunnel and reorganized the ramps and interchange around Chinatown. The Greenway was created as a lineal park on top of the new tunnel. In Chinatown, the Beach St. exit ramp was discontinued and covered over creating the space for the new Chinatown Park. With landscaping and umbrellas and tables in season, the park serves visitors, residents, workers and community events. It also defines the gateway from South Station and the Greenway. With the demise of the “Combat Zone”, major developments projects have sprung up at the edge of Chinatown on Washington Street, including luxury condominiums, hotels, rehabilitated theaters, and movie complexes. 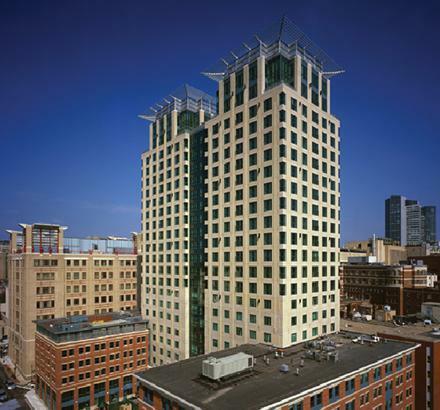 Emerson College and Suffolk University have rehabilitated or built dormitories and teaching facilities bringing new life. Other projects in the neighborhood are on the drawing board. While this has been mostly welcomed, there is also the danger of gentrification driving up housing prices making Chinatown itself too expensive for working class people and diminishing the vitality of the community. In 2010, the community – traditional organizations, residents, social service agencies – came together to develop the third Master Plan. Noting the increase of market-rate housing in the surrounding area and the rising rents for Chinatown, the plan emphasized the need for affordable housing, a cultural center/library, open space, education and social services. Oxford Ping On will provide 66 units of affordable housing. Land and funding from 120 Kingston project and 45 Stuart St. Developed by CEDC.